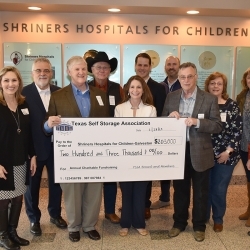 Several key, locally-owned self-storage businesses, which are members of Texas Self Storage Association, participated in raising $1.4 M for Shriners Hospitals for Children - Galveston. The hospital provides highly specialized acute, reconstructive and rehabilitative care for children with burns and other soft tissue conditions, regardless of a family’s ability to pay. Fundraising efforts continue in 2019. Austin, TX, February 14, 2019 --(PR.com)-- For 18 years, Texas Self Storage Association*, a state-wide organization headquartered in Round Rock, TX, has spearheaded fundraising efforts for Shriners Hospitals for Children - Galveston at its annual Big Ideas in Storage conference and trade show via live and silent auctions, a raffle, charity poker tournament and direct donations. One-hundred percent of the proceeds go directly to Shriners in Galveston. On January 28, 2019, TSSA Executive Director Ginny Sutton and fundraising co-chairs David and Doug Hunt were joined by other association members to present the hospital with a check totaling $203,000. This sum, which was raised October 7-9, 2018 at its Dallas conference, brings TSSA’s total donations to date to $1.4 million. Why Shriners Hospitals for Children - Galveston? Since the 1960s, Shriners has pioneered some of the most significant advancements in burn care. The hospital provides highly specialized acute, reconstructive and rehabilitative care for children with burns and other soft tissue conditions, regardless of a family’s ability to pay. Its efforts have doubled the survival rate for children with burns over more than 50 percent of their body surface. Today, patients with burns over 90 percent of their bodies can survive, and go on to lead full, productive lives. 2019 fundraising efforts are underway, which will culminate October 14-16 at the TSSA Big Ideas in Storage conference in The Woodlands, TX. More information at www.txssa.org. Photo Caption: TSSA donors, board members and staff present the Shriners Hospitals for Children - Galveston with donations and fundraising proceeds for 2018 totaling $203,000. Pictured: Ginny Sutton, TSSA executive director; Dave Morgan, SBS Construction; Doug Hunt, Access Self Storage, Fundraising Co-chair; Hank Daughtry, Trusted Self Storage Professionals; April Young, Ultimate Properties; Chris Martin, Ideal Self Storage and current TSSA president; Matt Janes, Rosewood Property Company, David Hunt, OMC, co-chair and wife, Trena; Jeanne Dube, Solid Ground Storage; Kaye Daughtry. *Texas Self Storage Association was established in 1986 and is a non-profit trade association dedicated to enhancing the quality of the self-storage industry in Texas. The Association provides opportunities for members to increase their knowledge of the industry through education, research, discussion and exchange of information. 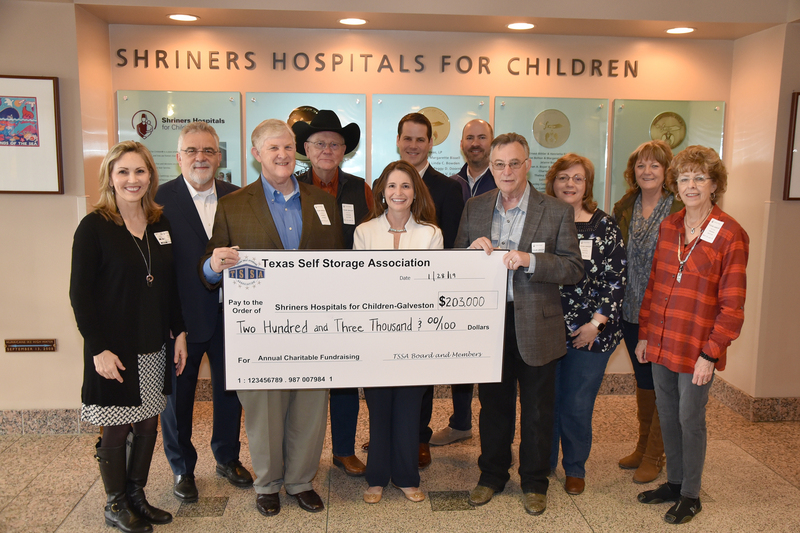 Texas Self Storage Association members, business owners, donors, board members and staff present the Shriners Hospitals for Children - Galveston with donations and fundraising proceeds for 2018 totaling $203,000, bringing the all-time total to $1.4 million.